Yup, it’s getting to be that time of year again, Cupid’s favourite holiday! We know you’re a super busy person, and that you may get distracted by the Olympics, or the Ground Hog’s day, the release of the Lego Movie, or whatever else you have going on. So we’ve decided to lend a hand and whip up some fast and easy Valentine’s Day gift ideas for you and your sweeties- however many there may be. DIY-ers rejoice! This one is for you. Book it to your nearest grocer, grab some pre-made cookie dough, shape into hearts and bake. Then just wrap in some cellophane and decorate with heart stickers and ribbon. Presto-delicio- edible valentines. They do say the way to a man’s heart is through his stomach. Book it to your nearest craft store, or eat a lot of jam. Clean out the jars and fill with layers of candy from the bulk food store. Decorate with some fancy ribbon and slap on a custom sticker from StickerYou.com. Easy-peasy lemon squeezy. Now this one is super popular with the ladies. Mix together 1c brown sugar, 1/2c coconut oil, 1/3 c almond oil and 2tbs of unsweetened cocoa powder. Pack it into a clean jar and label with a pretty custom sticker from StickerYou. Luxury you can buy in the baking aisle. Pick out some creative fonts and heart shapes and make whatever you want to say into custom temporary tattoos with StickerYou. Then clip out the tattoos, stick them to some card and decorate the back of the cardboard with pretty wrapping paper. People will be wearing YOUR heart on their sleeve for days. 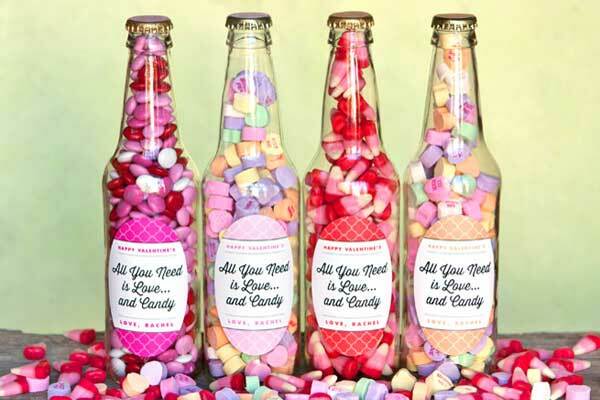 This is kinda like the Candy bottles mentioned above, but for the adults. It may require some recon on your part to find just what it is your Valentine likes to sip on, but once you do, grab a bottle of your Valentine’s favourite vino or brewski, soak the label off, and then slap on your own awesome custom wine or beer labels. Check out our templates here. This Valentine’s Day idea takes a bit of work, but it’s a lot of fun. Buy a bag of chocolate kisses from your grocer. Then use StickerYou’s Hershey Kiss Labels to make custom stickers, each with a different letter on them. Then put in a bag with a clue, ex: Three words. Watch as your sweetie spells out your Valentine’s Day message. D’awww!